Economical way to speed up truck loading and unloading. Spans the opening between dock and trailer to allow pallet or hand trucks along with people to safely move in and out of the trailer. 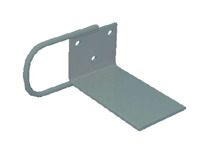 Constructed of high strength, lightweight aluminum alloy non-skid tread plate. Handles (Pic. 2) are located on each side for portability. Locking legs for OSHA complience. The bend or crown is 11 degrees and located 9" from edge of dockplate. Not for use with fork trucks. Note: Special sizes and capacities are available. Please contact ZORIN @ (888) 378-6525 if you do not see what you need.